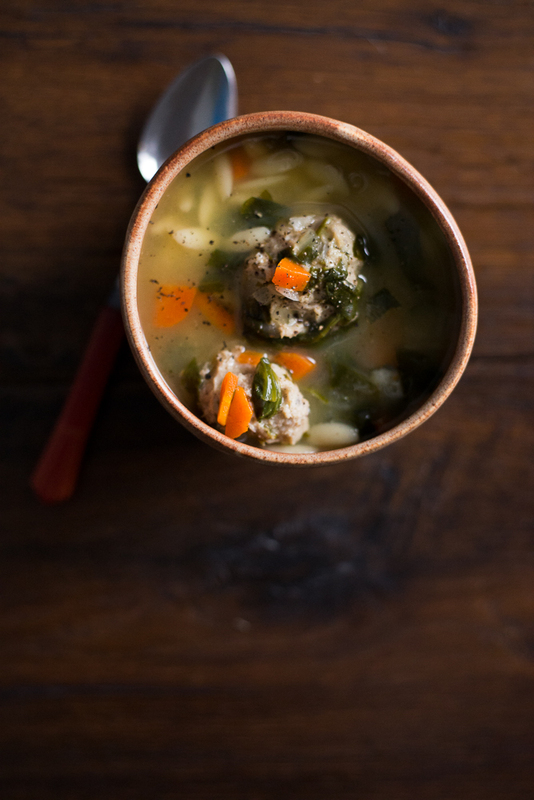 This recipe, which I got from a friend, is like an Italian Wedding Soup with flavorful meatballs, mild veggies, and rice-shaped orzo pasta. I was recently invited to a friend’s home for the weekend and I took this for all the kids. They ate it up and wanted seconds!! This is a great soup that has plenty of good nutrition, but has comforting, easy flavors for kids. I used escarole as a break from spinach. The escarole has a slightly tougher structure, so it stands up well to the cooking process and has a pleasant flavor. NO worries if you don't have escarole, you can easily use spinach or your favorite greens. Whisk egg and 2 tablespoons of water in medium bowl. Mix in bread crumbs, wheat germ and flax, and let stand 5 minutes. Add ground turkey, Parmesan cheese, parsley, minced garlic, salt, and pepper; gently stir to blend. Shape turkey mixture into 1 inch diameter meatballs. Place on baking sheet or plate cover and chill 30 minutes in refrigerator or 15 minutes in the freezer. In large pot, bring 8 cups chicken broth and ½ cup water to a boil. Add onions and carrots, reduce heat and simmer for 4 minutes. Add orzo and simmer another 4 minutes. Add turkey meatballs, and bring temp back up until boiling. Reduce heat and simmer 10 minutes. Stir in escarole or spinach, and simmer until meatballs, orzo, and greens are tender, about 5 minutes longer. Season soup to taste with salt and pepper. This is a great toddler dish, which can be pureed as little or as much as your baby needs. Consider reserving a portion for the baby before extra salt is added. For babies who are eating finger foods, the meatballs can be served separately once cut into tiny bites.